Now in its fifth year, Chicago Ideas Week kicks-off its first Spanish-language panel, Redefiniendo el Sueño Americano with influential leaders in media and business. Executive Chef and James Bear Award finalist Hugo Ortega, MIT’s Executive Vice President and Treasurer Israel Ruiz, Univision’s Enrique Acevedo, and WGN-TV’s Ana Belaval will lead conversation as part of Chicago Ideas Week to discuss the meaning of the American Dream and how . Media personality Ana Belaval spoke to Lawndale Bilingual Newspaper about Chicago Ideas Week and her definition of the American Dream. Lawndale Bilingual Newspaper: Chicago Ideas Week is hosting their first-ever Spanish-language panel, Redefiniendo el Sueño Americano, which you will serve as panelist. How were you approached to participate and what are you looking forward to the most? 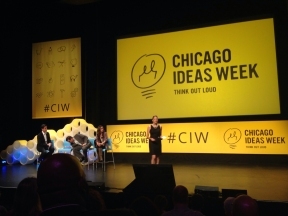 Ana Belaval: I was approached by Chicago Ideas Week to participate in its first-ever, Spanish-language conversation and was very flattered. I’m mostly looking forward to sharing the stage with the other panelists’ chef Hugo Ortega, Israel Ruiz and our moderator Enrique Acevedo. We all had different “American dreams” and we achieved them in different ways. I can’t wait to hear what they have to say. The premise of the panel is to discuss the concept of the American Dream. What does the American Dream mean to you and how has it evolved from your parents’ dream? I’m the first member of my immediate family to live in the United States. My parents went to college in the U.S., but returned to Puerto Rico to work and build their family. My American dream was to come to the United States to make my professional dreams come true. With hard work, determination, tenacity and luck, I was able to do that and much more. Now my American dream is that my children can enjoy the freedom to be bicultural in this country. What do you hope is the main takeaway from the panel discussion? I hope people can see that the American dream can have very personal definitions. For many immigrants, the American dream was to give their children a better life in the United States. For first and second generations, that can still be the case but it can also mean living their life choices to the fullest. 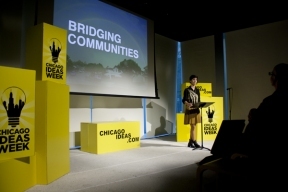 Chicago Ideas week begins October 12th through 18th. If you would like to learn more or register, visit www.chicagoideas.com.